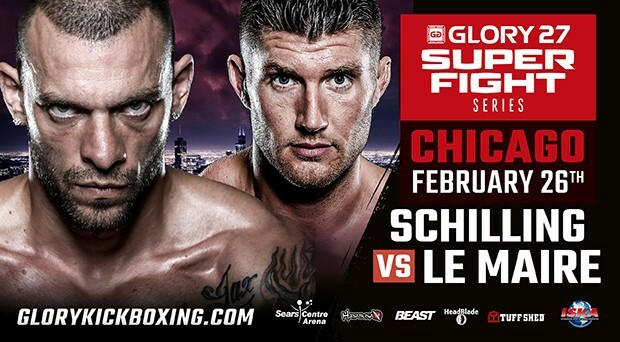 New York, NY – GLORY, the world’s premier kickboxing league, today announced a new headline bout for the GLORY SuperFight Series Chicago on Friday, Feb. 26. Sears Centre Arena in Hoffman Estates, Ill. hosts crossover mixed martial arts and kickboxing star Joe “Stitch ‘Em Up” Schilling (20-6, 12 KO), currently ranked No. 1 in the world, taking on fellow Californian Mike Lemaire (14-2, 7 KO) in a middleweight showcase bout. Lemaire was previously scheduled to compete later in the evening, as part of the one-night, four-man North American Middleweight Contender Tournament at GLORY 27 Chicago. In his place, GLORY newcomer Karl Roberson will step in to face No. 4 ranked middleweight Dustin “The Hanyak” Jacoby (7-6, 5 KO) in the opening round of the one-night tournament. Jacoby enters the bout on a three-fight winning streak. GLORY 27 Chicago airs live on ESPN3 at 10 p.m. ET / 7 p.m. PT on Friday, Feb. 26, with replays on ESPN2 at 9 p.m. ET / 6 p.m. PT on Sunday, Feb. 28 and ESPN Deportes at 9 p.m. ET / 6 p.m. PT on Monday, March 7. The official air time for GLORY SuperFight Series Chicago will be announced at a later date. Tickets for GLORY 27 Chicago and GLORY SuperFight Series Chicago are priced at $200, $100, $60 and $35. Tickets are available for purchase at searscentre.com and the Sears Centre Arena box office.